The longest government shutdown in U.S. history is taking a toll on the Pacific Crest Trail and the people who care for it. The PCT is administered by the U.S. Forest Service, one of the federal agencies whose workers have been furloughed in the ongoing partial government shutdown. We also work with the Bureau of Land Management, the National Park Service, California State Parks and many other partners to take care of this amazing trail. The PCT is one of 11 National Scenic Trails in our National Trails System, along with 19 National Historic Trails and countless other National Recreation Trails. Forest Service employees and those from the other land management agencies serve in many vital functions. One is that they ensure sound management and oversight of trails like the PCT so we can enjoy them. That seems overly simplistic, but it’s vastly important, both for the physical and mental health of people across the country. These dedicated employees provide a great public service that should not be dismissed. They need to go back to work, and they deserve to get paid. The Pacific Crest Trail Association is the nonprofit partner of the Forest Service. Every year, as part of our formal agreement with the agency, we marshal thousands of volunteers to maintain the trail by clearing logs, cutting back brush, improving the trail tread and repairing and replacing trail sections wiped out by fire or erosion. 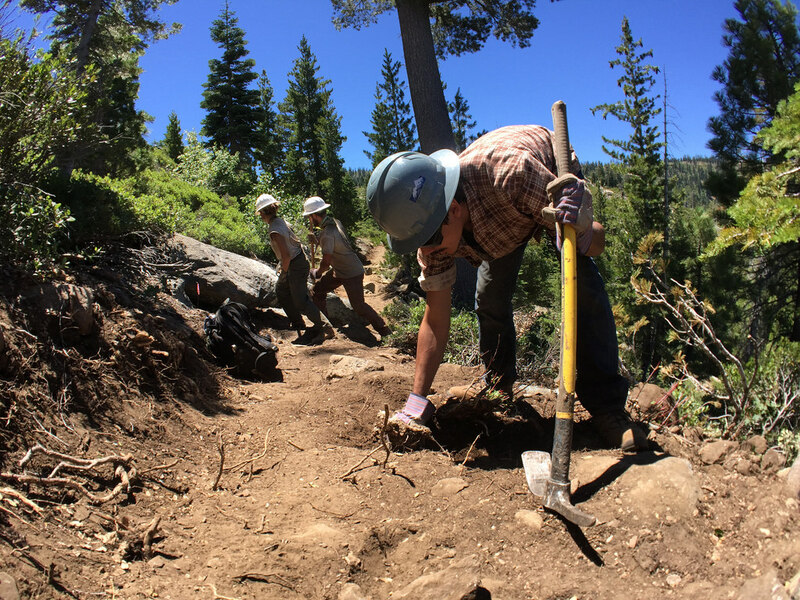 PCTA volunteers gave 118,524 hours to the trail in 2018, an in-kind value of $2.9 million. That’s simply phenomenal. 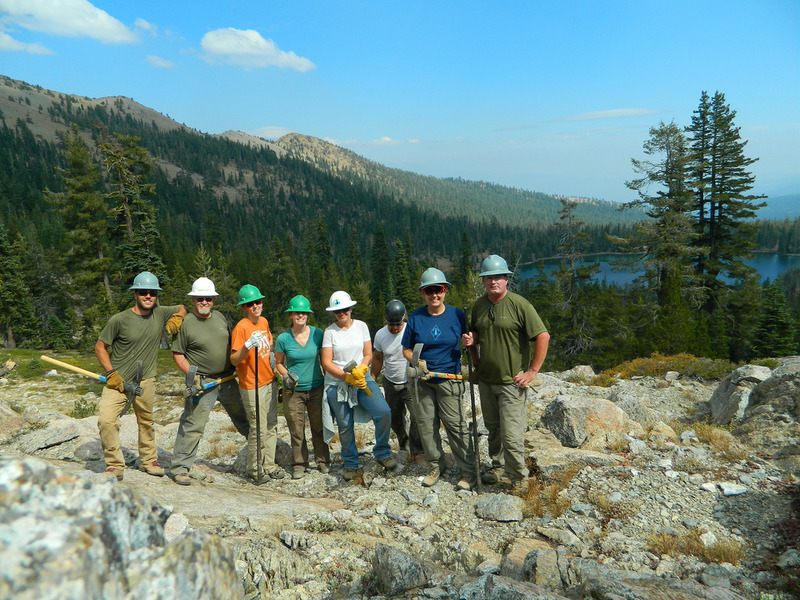 PCTA volunteers working on the Sierra Buttes reroute project. While uplifting stories abound of community members helping with maintenance in National Parks, long-time and formalized volunteer groups such as the PCTA are not allowed to work during the shutdown. We are expressly prohibited from doing trail work through our agreement with the Forest Service. That’s because the Forest Service cannot provide the required liability insurance if a volunteer is injured. And the agency’s emergency dispatchers are not there to answer radio calls from our backcountry work crews if they run into trouble. Without that safety net, PCTA volunteers are prohibited from working until the shutdown can be resolved. We’ve already cancelled work parties planned for Southern California and in the Columbia River Gorge burn area in Oregon. We have section adopters who can’t get out to do their regular scouting and maintenance. Agency administrative work all along the trail — from the hiring of seasonal crews and crew leaders, to planning summer volunteer maintenance projects, to the rewriting of complex forest management plans — has ground to a halt. Every day the shutdown continues sets this important work further behind. That’s just sad. When Congress passed the National Trails System Act in 1968, it formally designated the Pacific Crest and Appalachian trails as our first National Scenic Trails. The law called for the engagement of citizens to care for the trails as they crisscrossed our nation’s public lands. This was a contract with Americans to get involved in the stewardship of our most beautiful and precious places so that generations would be able to enjoy them. By all accounts, the idea was farsighted, because it has worked brilliantly. The PCTA’s NorCal Trail Crew at Toad Lake. From 2008 to 2017, volunteers working on behalf of the partner organizations for the 30 National Scenic and Historic Trails have performed more than 10 million hours of work on national trails. That effort is valued by federal agencies at $233 million. And in that same period, these groups raised $108 million in private funds. All this is an extraordinary gift to the public. The shutdown disregards all that positive energy. The dedication of federal land management agency employees to the Pacific Crest Trail and other national trails is amazing. Their work contributes directly to our well-being and our multi-billion-dollar outdoor recreation economy. They should not be penalized or used as pawns in a high-stakes political debate. Furthermore, the effort of PCTA volunteers and their counterparts on trails all across the country should not be taken for granted. They are true public servants: unpaid, they give from the heart and do it for others. Congress and the administration need work together to end the government shutdown so these people can get back to work on the trails that they love, trails that are there for all Americans and people from all around the world.